However, when we look more closely at the passage, several things come up that bring that interpretation into question. The images associated with the English word “Hell” in this passage clearly affect how it is understood by modern readers. However, that is not the word actually used by Jesus to describe the place where the rich man is abiding, and I am surprised that the original NIV translators chose to use that term in this passage when they never translate it that way anywhere else in Scripture. The English word “Hell” automatically brings to mind never-ending punishment. But, the Greek word Jesus actually used here does not communicate that idea at all. Jesus said the Rich Man was in Hades, and Scripture specifically teaches that Hades, as a place of punishment, does not last forever. Hades will one day give up the dead who are in it, and will itself be cast into the lake of fire. The sea gave up the dead that were in it, and death and Hades gave up the dead that were in them, and each person was judged according to what he had done. Then death and Hades were thrown into the lake of fire. The next thing we should note is that this is a parable. Jesus is telling a fictional story to teach certain truths to His hearers. 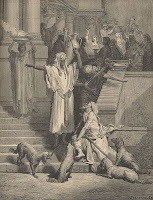 The audience for this parable is made up of two distinct groups of people – the “tax collectors and sinners” who were spiritually poor and recognized their need for God, and the Pharisees and teachers of the law who were materially rich and had deceived themselves into thinking that they were the ones favored by God. The focus of the parable was on those self-righteous religious leaders who were rich in the eyes of men, but poor in the eyes of God. Many of the Pharisees and teachers of the law to whom Jesus was speaking were actually clothed in purple and fine linen, and lived in luxury every day. He who has been good on earth, will be blessed in the kingdom of the dead, and he who has been evil on earth, will suffer in the kingdom of the dead. The story was later brought into Palestine by Alexandrian Jews, where it became popular as the story of the poor scholar and a rich tax collector named Bar Ma’jan. After the two men died, one of the poor scholar’s colleagues had a dream in which he was allowed to see the fate of the two men in the next world – the poor scholar was in “gardens of paradisal beauty, watered by flowing streams.” Bar Ma’jan, however, was standing on the bank of a stream trying to reach the water, but was unable to do so. In the original story, the religious leaders would have identified with the poor scholar, since they also were “scholars” who prided themselves on their knowledge of Moses and the prophets. They would have looked down with marked disdain on the tax collector in the familiar story who they considered a great sinner simply by virtue of his occupation. In an absolutely brilliant move, however, Jesus turns the tables on his listeners and identifies them not with the hero in the story, but with the villain. The religious leaders were the ones in the parable who were rich in this world’s goods, and proud in the eyes of God! Since the first part is drawn from well-known folk material, the emphasis lies on the new ‘epilogue’ which Jesus added to the first part. Like all the other double-edged parables, this one also has its stress on the second point, namely, that Jesus does not intend to give teaching about the after-life, but to give grounds for the refusal of the demand for a sign. Jesus drew on a story that was familiar to his hearers and changed some of the specific details in order to make a very explicit point. In His version, He pointed out in a very powerful way that it was the self-righteous religious leaders, not the tax collectors and “sinners,” who were the ones who were not listening to or understanding Moses and the prophets. Their pride and hypocrisy kept them from believing in Him as the Messiah, and they would not repent even if the greatest sign possible were given to them. Years later, in AD 70, the Roman legions came and destroyed the city of Jerusalem and the Temple, even as Jesus had elsewhere predicted. The religious leaders to whom Jesus was addressing this parable would be deposed from their high positions and experience great suffering at the hands of the Roman legions. But, even then, they would not believe. They would harden their hearts – even after One had been raised from the dead. Jesus was telling a parable. He drew on a fictional story that was familiar to His listeners in order to communicate a specific message to those to whom He was speaking. The original story talked about death and Hades, and Jesus appropriately kept that in His version. He was not relating definitive facts about the afterlife. He was using the story to communicate a specific truth about this life. What He did was similar to what a modern speaker would do when making reference to a book like The Lion, the Witch and the Wardrobe from the Chronicles of Narnia. He could clearly point out some very important truths about life in this world without putting his stamp of approval on the existence of talking animals in another world.